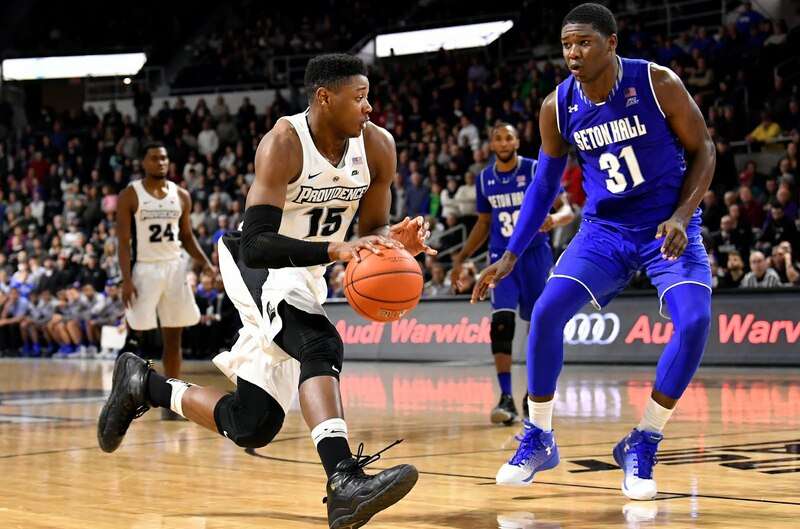 The Providence Friars dropped a heartbreaker in a game they could have easily won in New Jersey to Big East foe Seton Hall. The game when to overtime and ultimately, Seton Hall was able to pull out the victory in a battle between the middle-of-the-pack teams in the muddled Big East conference. Providence could have swept the Pirates and come away with a road win against a very similar team that would have separated them when comparisons start to come up between teams at the end of the year. In a game where Desi Rodriguez was basically invisible on the floor, point guard Khadeen Carrington stepped up to take the reigns for Seton Hall, scoring 21 points on 8-14 shooting. Angel Delgado got his usual double-double with 19 points and 15 rebounds while dominating the glass against a smaller Friars frontcourt. On the Friars side of things, Rodney Bullock led all scorers with 19 points but didn’t shoot well from the floor at all, recoding most of his points from the free throw line (9-10). Kalif Young started over Emmitt Holt, although Holt ended up playing starters minutes. The rest of the starting lineup was good but not quite good enough, coming up just two points short on a win that would have really helped this Friars team. Maliek White is getting better and looking more comfortable every game. It looks like he’s taking a page out of Kyron Cartwight’s book when it comes to pushing the pace on fast breaks. Out of all the Freshmen, I think Maliek might be the best finisher on fast breaks. Maliek only had those two points, but he also recorded 5 rebounds and 5 assists in 15 minutes of action. As I said before, Rodney Bullock led all PC scorers with 19 points, however he was just 4-12 from the floor. He was 9-10 from the line to up the scoring, but as James Harden would tell you, getting to the free throw line is a skill too. The 3 blocks from Bullock were nice too. Alpha Diallo played really solid with 9 points on 4-8 shooting. I have a feeling that he’s going to take a huge step in his Sophomore year. Kyron Cartwright was effective but not his otherworldly self. He shot just 6-17 from the floor, chipping in 5 assists, 3 rebounds, but 3 turnovers as well. His finishing from 10 feet and in is still next level stuff. Emmitt Holt was definitely more offensively aggressive off the bench. I’m not sure the last time Holt took double-digit shots in a game. Holt was 5-11 from the floor for 14 points. Going up against one of the best rebounders in the Nation in Angel Delgado, Holt’s rebound numbers were obviously hurt, only grabbing 2 boards to Delgado’s 15. That’s what happens when a guy who is a natural 4 goes up against a natural 5. Holt does have a knack to finish through contact. The rest of the squad, Kalif Young, Ryan Fazekas, and and Isaiah Jackson had a combined 5 points in the game. Isaiah did have a nice finish from the new fast-break started Maliek White. Angel Delgado is a double-double machine and a really bad matchup for this Friars team. Jalen Lindsey was his usual self from 3 going 2-5 from deep but only shot the ball a total of 7 times for 8 points. Lindsey was a force on the boards with 12. I thought Pirates Freshman Myles Powell looked really good, tallying 14 points in 34 minutes off the bench.